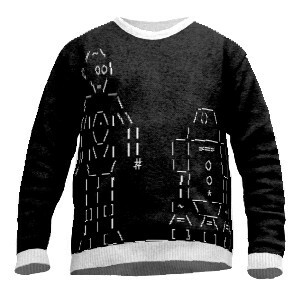 Edit design ASCII Art Sweater , or create your design from scratch. ASCII Art Sweater is your knitted personal design piece with no minimum order quantity. Create your own unique design to be knitted in. For christmas or throughout the year when it's cold outside, enjoy this sweater with truely knit in design. It feels like spending your days in retro 80s traditional knitpiece land. Design your custom Ascii style sweater and order online now.